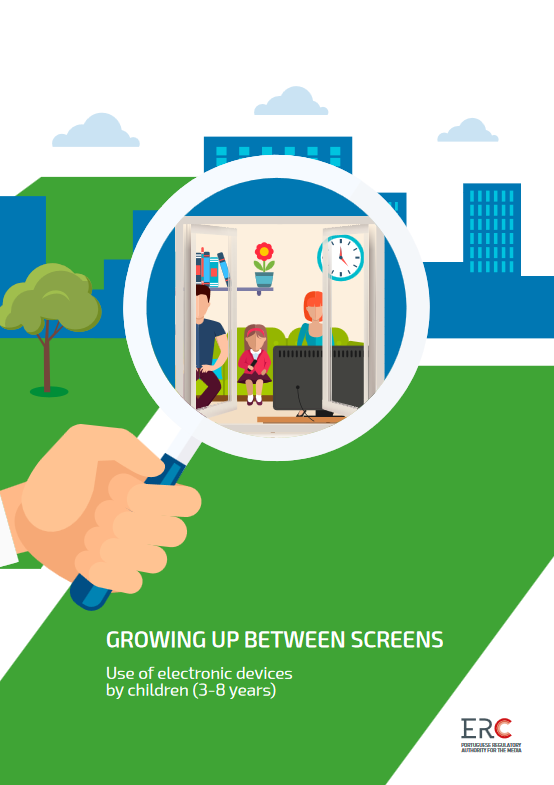 The Portuguese Regulatory Authority for the Media (ERC) has issued in February a report on the use of electronic media by children in Portugal entitled “Growing up between screens: use of electronic devices by children”. The study seeks to understand how pre-schools and primary age children use electronic media at home and elsewhere. It identifies the electronic devices (televisions, computers, consoles, mobile phones, tablets) which children of these ages use, their means of media access, how parents monitor children's media use and their main concerns about it. The report is built on two components: the first part is based on a national survey carried out in 656 homes, which included a questionnaire for the parents of children aged from 3 to 8 and another for those aged from 6 to 8; the second part is constituted by interviews and observations in the homes of 20 families with different profiles. The objective of the study is to help parents, family members, educators, public policy and decision-makers to monitor the relationship between children and the media in a more knowledgeable way. Consumption: mobile phones and television screens are the most common devices used at home. All children watch television, half play video games and 38% use the internet. The latter is mainly used for entertainment purposes e.g. watching cartoons and films, playing games or listening to music. Television is used to watch cartoons and other children’s programmes. Family dynamics: around two-thirds of the families interviewed have only one child. Most of them have obtained secondary education and one-fifth has intermediate or higher education. The same proportion has not completed its compulsory schooling. Children from highly educated families are those who most access and use the internet. Installing games and finding interesting content are the most reported digital skills of children. Prevention: parents expressed greater concern related to the internet than they did to television. Less than half of the parents are concerned about the amount of television their children watch, considering it to be under control. Parents’ greatest concerns are about violence which could be unsuitable for their children’s age, the time children spend in front of screens and their internet dependency. This report represents the 3rd publication of the ERC’s project called “Publics and Media Consumption”. The two previous issues were on News consumption in Portugal (2016) and Publics and Media Consumption (2015).